Michael Gruber discusses the controversial changes to New York’s workers’ comp rules that were put into place earlier this year. Workers’ compensation is one area of law that’s constantly adapting to the society around it. Some of the changes it goes through are for the better, while others are challenged by both injured workers and the attorneys that represent them. 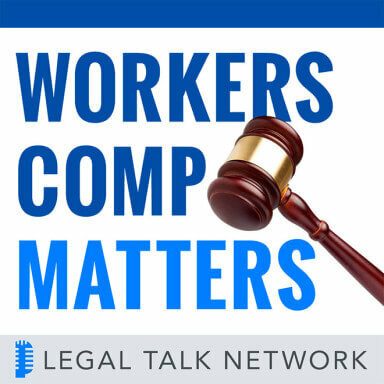 In this episode of Workers Comp Matters, host Alan Pierce talks to Michael Gruber about the controversial changes to New York’s workers’ comp rules that were put into place earlier this year. They explain the budget changes that lead to the shift in impairment guidelines, the secrecy of the decision process, and the resulting backlash. They also discuss what national workers’ comp issues will likely draw the most attention in 2018 including marijuana, opioids, and immigration. Michael Gruber, a partner at Pasternack Tilker Ziegler Walsh Stanton & Romano, LLP, handles workers compensation cases for the firm. Alan Pierce: Welcome to Legal Talk Network. This is Alan Pierce, host of Workers Comp Matters. I am an attorney at Pierce, Pierce & Napolitano in Salem, and we are bringing you another edition of Workers Comp Matters with guest Michael Gruber. Before we get into our topic with Michael, we want to thank our sponsor Case Pacer, practice management software dedicated to the busy trial attorney. To learn more, go to HYPERLINK “http://www.casepacer.com/”casepacer.com. And our other sponsor we would like to thank is PInow. Find a local qualified private investigator anywhere in the United States, visit HYPERLINK “pinow.com”pinow.com to learn more. Today’s guest is Michael Gruber. Michael is a partner, and I am going to take a deep breath, in the Law Firm of Pasternack, Tilker, Ziegler, Walsh, Stanton & Romano, LLP, in New York City and other satellite offices; I believe Michael is a partner in their Brooklyn office. Michael is a graduate of Michigan State. He earned his JD degree from the University of Denver College of Law. He has been a workers’ comp lawyer for over 20 years. In addition to litigating workers’ comp claims, he oversees the Workers Compensation Appellate Division practice at the firm and he has been a member and leader in a variety of local and national bar associations and professional groups. Most recently he just completed a very successful term as President of WILG, which is the Workers’ Injury Law & Advocacy Group. So with that having been said, I would like to welcome Michael to Workers Comp Matters. Welcome. Michael Gruber: Thank you very much Alan. It is a pleasure to be here. Alan Pierce: All right. So you practice in New York and I have been reading online a variety of posts about some recent somewhat controversial changes that are being proposed to the workers’ comp statute in New York and I know you and your firm are representing the interests of injured workers, have taken a pretty vocal stand. Why don’t you give our listeners an overview of what’s been proposed and the status of these possible changes? Michael Gruber: So in New York, as many states do, a variety of types of benefits are available to injured workers. One of the benefits we have here in New York is for extremity injuries, injuries to arms, legs, way down to the fingers and the toes, and we have what are called Schedule Loss of Use Awards for permanent injuries to those extremities, for injuries to the extremities. These are types of awards that you can get regardless of whether or not you missed a day from work. In New York, for injuries to your neck, your back, your head, you have to be out of work in order to get any monetary benefits, but for any injury to an extremity that results in a permanent injury, you are entitled to a monetary award. Now, the value of the extremity, for lack of a better way to put it, is statutory. The value of an arm is in our statute, it’s 312 weeks; leg 288 weeks; that goes all the way down to the fingers and the toes. So in April of 2017, as part of the negotiations over the New York State budget several workers’ compensation changes were passed as part of the budget, and the vast majority of these were detrimental to injured workers. And one of these changes was for the Governor’s Office to direct the workers’ compensation to update the permanency guidelines, meaning that the Board was directed to change, not the value of the extremity, because that’s statutory and it would have to be done legislatively as opposed to through the budget, but how the award for permanency is determined. So they were supposed to take into account modern medical techniques, what has changed over the last 30 some odd years, and update how the impairment determinations were decided by the doctors. So on September 1 the Board issued their proposed guidelines, and it will tell you what the Board thought of these things when you find out that the Board issued these in a press release on the Friday before Labor Day in the afternoon, where all news goes to _______ obviously. So they knew these were going to be a problem and I think that’s why they put them out when they did. And they gave a commentary period for all parties who wished to weigh in on these new proposed guidelines, which just recently ended on October 23. Now, the problem we have with these guidelines is that they don’t take into account the Governor’s mandate to reflect advances in modern medicine. The Board as part of their research and their process in coming up with these new proposed guidelines indicates that they consulted with all relevant stakeholders. I can tell you that they didn’t consult with injured workers and they really didn’t consult with labor at all. I am fairly confident that the people they consulted with most were the Business Council, but they did also consult with the New York Stare Society of Orthopaedic Surgeons. They had actually been consulting with the New York State Society of Orthopaedic Surgeons for quite some time in their efforts to revise these guidelines, even before the Governor’s budget had passed. And it turns out that the Board got some recommendations from the orthopedic surgeons on what exactly has changed in modern medicine that would update these permanencies, and then proceeded to ignore everything that the orthopedic surgeons told them should be put into these guidelines. Now, the only reason that we know this is because the Assembly Democrats held hearings on this and they called the Workers’ Compensation Board General Counsel and some Medical Directors from the Workers’ Compensation Board came to testify before the New York State Senate. And it was very enlightening. It basically shed light on a process that was very secretive in nature. I think that’s the problem a lot of us had with the process that the Board used that it wasn’t very open, it wasn’t very transparent, and it seems like that only one side of the equation had _______ to what these updated impairment guidelines should be. As you well know Alan, workers’ compensation is predicated by its very nature on the bargain between labor and business and when _______ the bargaining on the other side is not, it leads to inequities and that’s what we saw in these new proposed guidelines. Again, they didn’t reflect any modern advances; what they did was they basically — they basically just reduced what would sort of be considered medically normal values for range of motion, which a lot of these awards are predicated on. For example, medically range of motion for a shoulder in elevation has been 180 degrees, as long as I can remember it has. The Board now considers forward elevation of 160 to be normal. Normal range of motion in knee that they consider normal to be 105 degrees, where normally it would be much greater than that. Now, advances in modern medicine Alan don’t make range of motion in the shoulder to become less; advances in modern medicine should mean that most people should have greater range of motion after a course of treatment as opposed to lesser range of motion. Alan Pierce: Yeah. So actually what you are describing, I know that in New York, correct me if I am wrong, your impairment ratings are not based on the what I guess I will say the controversial Sixth Edition of the AMA Guides, but when the AMA Guides were revised in the Sixth Edition maybe five or six years ago, the reduction in impairment ratings was attributed also to improvements in medical outcomes and medical treatment processes, and of course around the country where those guidelines were challenged basically the same arguments were mounted that certain things don’t change. So where is this left, you indicated the comment period is just about over, is this going to be voted on by your Assembly, do you expect it to be signed by the Governor, what’s your prediction? Michael Gruber: It’s actually regulatory Alan. It’s not something that’s done legislatively, which is part of the problem. The Board has the authority to modify these guidelines; they have the authority to do so. And what happened when we first got to read these guidelines and the AFL-CIO and other labor unions got to read these guidelines and I think some of the medical providers got to read these proposed guidelines is that there was a tremendous backlash, because they didn’t do what they were supposed to do. And so labor unions mobilized their forces, attorneys mobilized their clients who would be directly impacted by these slashes to their potential awards. And I think the Board received a lot of negative publicity because of the draconian nature of these cuts to benefits. Again, the assembly hearings put a lot of pressure on the Board, because that got the legislators who theoretically had signed off on this change during the budget negotiations saying, wait a minute, this is not what we signed up for, this is not what we told you to do. So right now there has been no resolution of this issue. The comment period ended on October 23. What the Board says it’s going to do is going to look at all the comments they receive, weigh whether or not the comments have any validity, and then decide whether or not the proposed regulations will be implemented or whether or not they will be revised. And again, a lot of the legislators are asking for a lot more information and you are right in terms of what we use in terms of our impairment guidelines, we are not an AMA Guideline state, we have developed our own impairment guidelines, our own permanency guidelines. Alan Pierce: All right, I think this might be an appropriate place to take a break and in fact it may dovetail very neatly to what I think we are going to come back to after the break and discuss constitutional challenges to workers’ comp statutes and perhaps how this scenario that’s evolving in New York might possibly result in something similar. So we are going to take a quick break, we will be back with Mike Gruber in just a few minutes. Alan Pierce: And we are back with guest Michael Gruber from the great State of New York. Michael, we left off discussing the regulatory changes that might be expected in one fashion or another in New York, let’s shift gears a little bit. I know we have done other programs featuring guests who are claimant attorneys from around the country that belong to an organization that is obviously near and dear to my heart, which is the Workers’ Injury Law & Advocacy Group, otherwise known as WILG. You just finished a term as President. And I know WILG, which encompasses attorneys from around the country, looks at workers’ comp in a broad sense and I would like you to perhaps update our listeners as to what some of the national issues that might affect local states and local jurisdictions that are happening that practitioners, no matter where you practice, need to be aware of. Michael Gruber: No problem Alan, certainly. Alan Pierce: So you have traveled the country in your year. Michael Gruber: I did and WILG is just as near and dear to my heart as it is to yours. The year I spent as President of WILG was exceptionally fulfilling. And there’s a couple of things going on around the country that I think are going to be significant issues nationally in workers’ compensation in several states over the next year or so or even farther into the future. And the biggest picture item is the continued utilization of constitutional challenges to stop the race to the bottom for the workers’ compensation reform or deform as we generally like to call it since every single reform measures seems to negatively impact injured workers. And several states over the past year or even longer than that, but especially in the past year or so have been successful in challenging their workers’ compensation statutes, either in whole or in part, using provisions of their state Constitution. It goes back to Florida a couple of years ago with their challenges to attorneys’ fees and the limitations on temporary disability benefits. The most recent one is a decision in Alabama from earlier in the year, Clower v. Caremark, where the attorneys there used three types of constitutional challenges; one an equal protection argument, they used a due process argument, and they also used a separation of powers argument to strike down attorneys’ fees provisions, limits on the amount of benefit caps in Alabama. And one of the significant things about the Alabama decision is that Alabama has a non-severability clause, which means that once one provision of the workers’ compensation statute was found to be unconstitutional, the entire statute was therefore deemed to be unconstitutional. And just recently in the last month or so the Alabama State Bar has put together a panel of attorneys of both claimants’ side and the carriers or employers’ side to try to come up with a reasonable solution to their workers’ compensation problem now that their statute has been declared unconstitutional. The reason that this is important is because this is the first chance at meaningful workers’ compensation reform on the injured workers side in more than a quarter century. So these types of challenges that have been going on in Florida, in Alabama, in Utah, in Pennsylvania, I think we are going to see a lot more of these challenges. And I think the reason that you are seeing these challenges Alan is because the traditional method for labor, for injured workers, to effectuate workers’ compensation change is the legislative process, but that is increasingly across the country becoming dominated by business interests in each state. It’s a generalization I know, but it seems to be true that where Republicans control all parts of the state government, business interest seems to be ascendant over those of injured workers; not necessarily true, as we are finding out here in New York, but it’s a pretty consistent pattern across the country. So the traditional avenues for injured workers to try to stop bad changes in workers’ compensation from becoming law is being foreclosed, and so we are going to have to try to come up with new and novel or different arguments or different venues in order to try to regain some adequate level of benefits for injured workers across the country. So that’s really by far the biggest picture item. Alan Pierce: Yeah. In fact, I think you can add Oklahoma to the list; I think New Mexico in terms of including farm workers or agricultural workers. You are right, we can battle the legislature year in and year out and effectively not get anywhere or not make the progress we used to make; we being those of us who are on the side of the working men and woman, yet the courts, when issues are framed, as you put it, equal protection, due process, there’s an underlying foundation to these constitutional claims, which is in a sense a breach of contract. You mentioned it earlier during the first part of this program, when you talk about a contract between labor and management, in exchange for losing the tort remedy, you gain the workers’ comp remedy. So when that bargain has been struck and the benefits have been established, then there is a consistent whittling away of those benefits, a take away without a valid reason, other than saving payroll and expense, you reach a period of imbalance. And if the legislature doesn’t respond to it because of the political pressures, you have the courts. That while courts you can argue may be political, I would argue they are less political than a legislature. So for example, let’s take your regulatory change in New York and let’s assume that your agency reads, but doesn’t pay attention to the comments and they ignore the mandate of the budget process to base their reduction of ranges of motion or impairment rating simply in an arbitrary method without taking into an account medical science and you can’t fight City Hall, so to speak, do you envision that could create a scenario that one might raise a constitutional challenge? Michael Gruber: Potentially Alan, potentially. And I apologize for leaving Oklahoma out of it. I know that you have had Bob Burke and probably several people talking about the Opt-Out decisions, which is why I didn’t want to go into that. But in a speech I gave in Montana recently I called the Vasquez decision in Oklahoma on Opt-Out probably the single most important workers’ compensation decision of the past 20 years, because it didn’t end the Opt-Out threat, but it put a serious damper in the momentum of the Opt-Out threat throughout the southeastern part of the United States. But with respect to your question about New York, the problem is this is not a legislative issue, this is a regulatory issue. So if there’s going to be a challenge that we can mount to that it might not be a constitutional issue; if it is, it probably would fall under the due process part of our Constitution, because as I said, a lot of this was done in secret, a lot of this was done behind closed doors and without any input from all of the relevant stakeholders. So it might be a due process issue. Alan Pierce: Give us an overview, if you could, of some of the other issues that are resonating across the country. Michael Gruber: Couple of things. One I think medical marijuana will be a big issue across the country. As marijuana becomes legalized in the states, both on a medical basis as well as a recreational basis the question will arise as to whether or not, since it is still illegal on a federal level, State Workers’ Compensation Boards or agencies will require workers’ compensation insurance companies to pay for it as a valid medical treatment. I know here in New York our workers’ compensation agency has said they will not make the workers’ compensation carriers pay for it, as well as some other states; that has been ruled differently. Secondly, I think immigration issues. Given the current attitude in Washington and the increased emphasis on immigration and the deportation of undocumented workers, I think benefits for undocumented workers is going to be a hot topic in the next year or so. We have already seen in the past year, since the new administration has come into the White House, several of our colleagues across the country expressed reservations about filing claims for undocumented workers. And I think there was a ProPublica article that was published recently detailing the situation in Florida, where an undocumented worker gets hurt and all of a sudden the employer miraculously discovers that they have hired a person who is not in the country legally and calls immigration on them and they get deported. The third one I think is healthcare. Again, we are just sort of learning how the ACA interacts with workers’ compensation, who knows if that will be repealed, and if it’s repealed what will replace it. So if the Trump administration continues its assault on Obamacare and replaces it with something else, we will have to figure out how the interaction between whatever new system we get and workers’ compensation will move forward. So I think those are three of the biggest issues that we will get moving forward. Alan Pierce: Yeah. And Massachusetts has had medical marijuana now, I think it may have been passed two or three years ago, the dispensaries first opened maybe a year or two ago, and it’s unsettled law in Massachusetts as to whether a workers’ comp carrier can be required to reimburse or pay for pain — primarily pain management through the use of cannabis. And among the issues on a couple of cases that are pending on appeal has to do with the fact that these insurers are out of state and it’s a violation of federal law and they are concerned about their liabilities either using the mail or somehow across state lines from a state that doesn’t legalize cannabis or marijuana to reimburse. So these are issues I think that are going to have to be sorted out in the courts. Michael Gruber: And I think one other thing Alan, if you don’t mind my interrupting, this sort of also interacts with the other big issue which I should have mentioned is the opioid issue and that’s another big one. And when you see states putting an increased emphasis on getting workers’ compensation or injured workers off of long-term usage of opioids, they necessarily need to go to alternative programs, either inpatient rehabilitation programs or to less addictive type of pain relief methods, and one of those is obviously, potentially, medical marijuana. So it all ties in together. The opioid issue is another one that is — it’s been big for a while, but I think it will continue to be one of the hot topics across the country is weaning injured workers off of long-term use of opioids, and I know Massachusetts is really taking the lead on that with their program that they have implemented up there. Alan Pierce: Yeah. And you are right, it does intersect, and in many ways positively, for those of us who might be proponents of the use of medical marijuana as an analgesic substitution for opioid, it’s cheaper, it’s safer, and it’s less harmful to the user and her family. So this is all what — you know what Michael, this is all what makes practicing workers’ comp interesting, special and unique among other areas of law, it’s always changing; sometimes not for the better, oftentimes for the worse. And I want to congratulate you, our colleagues at WILG, and those of us who practice, whether we represent injured workers or represent insurers, we are in a unique area of the law and it’s always changing, evolving as the workplace evolves and the society evolves. So having said that, I want to thank you very much for being, I guess, a repeat guest on Workers Comp Matters. I want to thank you for joining us. I want to thank our listeners for listening to us. Rate us on Apple Podcast if you can. And for those of you listening, please tune into our next show and go out and make it a day that matters. Thank you.